Sandra Bullock was out in Los Angeles on Monday night, for a screening of her new film Bird Box. The actress, 54, posed for photographers at the TCL Chinese Theatre in Los Angeles while wearing a strapless black and gold Vivienne Westwood gown with an orange strip down the front and a high slit. She paired the look with minimal jewelry (save for a statement earring), and wore her shoulder-length hair hair down. Bullock’s night out at AFI Fest came shortly after the news broke that she’d donated $100,000 to the Humane Society of Ventura County, California (HSVC). Three separate fires — two in the southern part of the state, one in the north — started raging last week. They’ve already burned hundreds of thousands of acres, claimed at least 42 lives and left 228 people missing, according to BBC. The HSVC and other rescue organizations have been working tirelessly to save and re-home local pets and farm animals. On Sunday night, the group announced that it was “deeply humbled” by a $100,000 donation that came in from Bullock and her family that morning. Meanwhile, Bird Box tells the story of two sisters — played by Bullock and Sarah Paulson, 43 — who are suddenly thrust into an apocalyptic environment where people around them start to behave abnormally for seemingly no reason. They realize that to protect themselves from the mysterious force, they must wear blindfolds whenever they’re outside. 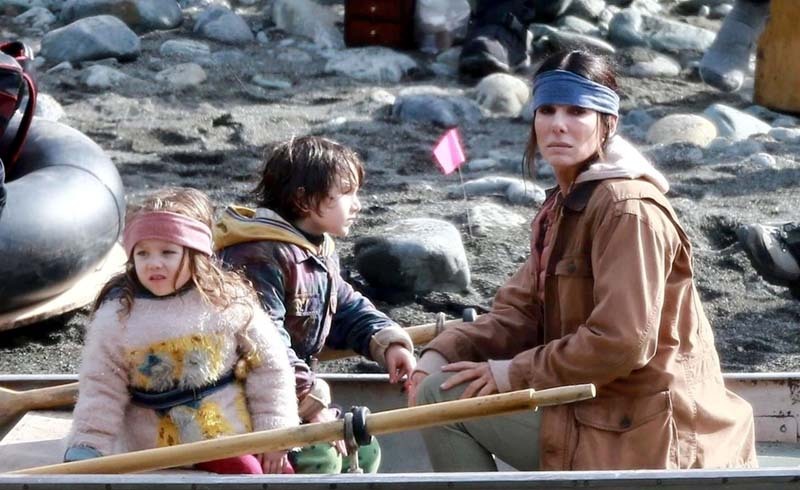 Unable to see, Bullock’s character runs with her two children searching for safety. The film hits theaters for a limited engagement on Dec. 13 in Los Angeles, New York, San Francisco, and London. It will hit Netflix on Dec. 21. Bullock's donation "will help the HSVC provide 24/7 care for the scores of horses, bulls, donkeys, pigs, chickens, ducks, dogs, cats and other pets evacuated from the fires," shelter staff says.